Listen to Ace Cannon on Tuff and Sittin' Tight. You've seen the albums in thrift shops time and time again, probably almost as many times as you've seen Herb Alpert's Whipped Cream And Other Delights. And you've probably passed over them just as many times as you've passed over that one. The albums in question are those of the Bill Black Combo, the best of which—Saxy Jazz—is as integral part of the Memphis sound as anything that Booker T. and the MG's or the Mar-Keys ever recorded. Why, you may ask, is this record so good? Well, there are many reasons, not the least of which being the presence of grinding sax maestro Johnny "Ace" Cannon. As the liner notes to Saxy Jazz indicate, Black had scored a hit with the single "Smokie," but when saxophonist Martin Willis, who'd played on the 45, was unavailable, Cannon was called to the LP session at Memphis's Royal Theater. The joint had recently been converted to the Hi Recording Studio under the supervision of Sun Rockabilly maniac-turned-producer Ray Harris, who knew Cannon from his own halcyon days recording for Sun. Along with Carl McVoy on piano, Reggie Young on guitar, Jerry Arnold on drums and Black himself on bass, the recording was a match made in greasy instrumental heaven. A new version of "Smokie" (:Smokie—Part 2," natch) was laid down, along with back-alley originals such as "Cyclone Bop," "The Wheel," "Crankcase" and "Before Dawn." Their treatments of "classics" such as "Frankie and Johnny," "Tuxedo Junction" and especially "White Silver Sands" were also attractively low down. 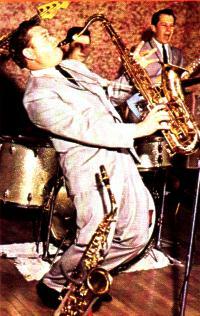 Cannon left the combo in 1961, shortly after the release of Saxy Jazz, and promptly scored a top twenty country hit with "Tuff," following it up with his great rendition of "Blues Stay Away From Me." And he's been tearin' it up in his uniquely Memphis-style ever since.